Right here, find great 100th birthday wishes — the kind of birthday messages that Queens, Presidents, Prime Ministers and other Heads of State would send to 100 year olds worldwide. Turning 100 is obviously a major milestone but the birthday message you should choose for a 100 year old is not so obvious. The kind of 100th birthday greetings you typically see online would probably do the trick, but you really shouldn't just "get by" with your birthday verse. You want to stand out. 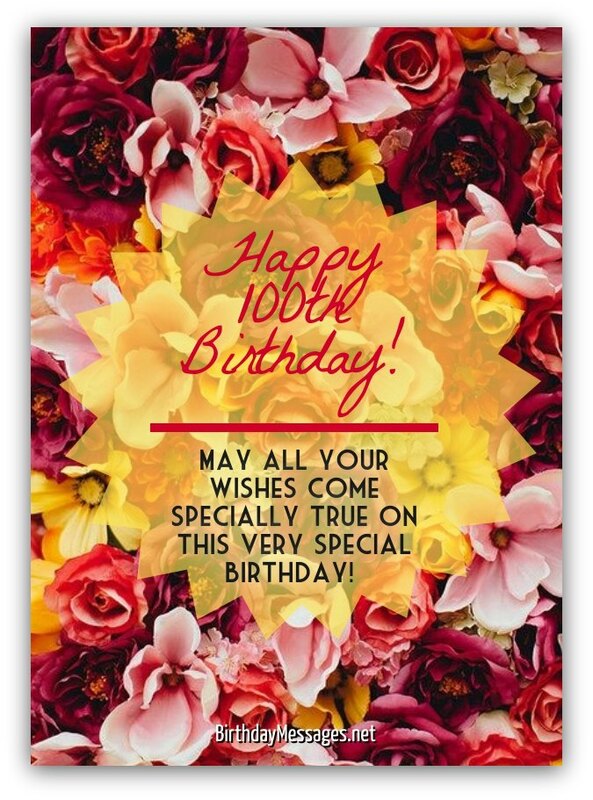 For me, truly outstanding 100th birthday messages capture the journey of your loved one at the cusp of turning 100. That could mean taking a good, long look at the 100th birthday girl or boy before you start your search for the perfect birthday wish below. Unsure how to start? 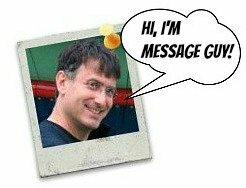 Do yourself a favor and check out Message Guy Tip #29, which is full of great tips on choosing the best 100th birthday greeting. Today is our chance to celebrate a major milestone — the day you were born 100 years ago. It’s a blessing you’re still with us. You are a blessing. Always have been! Happy 100th birthday! On this special day, saying congratulations is not enough. You deserve a Medal of Courage, a Purple Heart, a street named after you, at least a parade in your honor. Happy 100th birthday! May all your wishes come specially true on this very special birthday! Happy 100th birthday! You should be proud of yourself — not because you've turned 100, but due to the fact that you've lived the last 10 decades with integrity, honor and the commitment to making our world a much more beautiful and loving place. Happy 100th birthday! To celebrate your life and the joy you have brought to the lives of others, we are lighting 100 candles in your honor! 100 reasons we love and respect you! Happy 100th birthday! I can think of 100 reasons why you're so special — one for every year you've graced this world with your love, kindness, wisdom and strength. I cheerfully wish you the most cheerful of birthdays to the most cheerful 100 year old I know. Happy 90th birthday...for the 10th time. Before you blow out your 100 candles, don't forget to remove your dentures. You wouldn't want to injure anyone. Happy 100th birthday! Need to look at more options? Enjoy your special day because turning 100 doesn't happen every day...only every 100 years. Have a special 100th birthday! Now that you're turning 100, I only have one thing to say to you: I hope your amazing genes run in the family. Happy 100th birthday! You're very lucky. You're now 100, you're healthy, you're still mentally sharp and can answer almost anything anyone asks you..except about your age. Happy 100th birthday! The world's greatest gift on your 100th birthday is a one-of-a-kind, irreplaceable, priceless gem. It's you, of course. Happy 100th birthday! On your 100th birthday, it is my honor to award you the Medal of Valor for 100 years of spreading love, kindness, hope, forgiveness, wisdom and joy in the face of danger and delight. You're my hero. Happy birthday! The best birthday wish I can extend to you is to live out your days the same way you've lived right up to this very moment: with the love and respect of friends and family. Wishing you the happiest and warmest of birthdays! Your love and kindness has touched everyone you've known for a century. Have a wonderful 100th birthday! This is one of my top picks because it cleverly and creatively argues that laughter is the best medicine in life. And when it's a lesson that comes from a 100 year old, it carries much more weight. If I had to choose the three most important lessons you've taught me, they would be: (1) Laugh at yourself; (2) Laugh with friends and family; and (3) Laugh at life. It’s better than crying. Ha, Ha, Happy 100th birthday!